Since its foundation, the German Academy for Children’s and Youth Literature monthly marks three new publications in the sections young adult, children’s and picture book as the ‘book of the month’. The titles are selected by an honorary jury from all new publications. These well-established ‘book of the month’ selections function as directory and are referred to by young readers, parents and teachers as well as librarians, booksellers and publishers. In total, over 1200 books have been recommended in recent years. 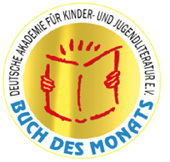 The seal of approval of the Academy has become a trademark for recommended children’s and youth literature. In this way, the Academy is constantly trying to make an up-to-date contribution to the work with children’s and young adult literature and to promoting reading. Looking back, it can be seen that many of the recommended new publications have, over the years, turned into so-called ‘classics’.